1.- Organizing a "Hellenic Network" on a world wide basis with 34,000 members, of which nearly 8% hold a PhD degree. 2.- Forcing the Greek Government in 2000 to keep the word "Hellenic Genocide" within the text of the Greek Law 2645/98, which is the basis of Greek legislation regarding the Hellenic Genocide. 3.- Prevailing upon the History Channel to replace their outrageous and insulting annual Christmas Spectacular statement that "St. Nicholas was a Turkish Bishop" with the accurate "St. Nicholas was a Greek Bishop". 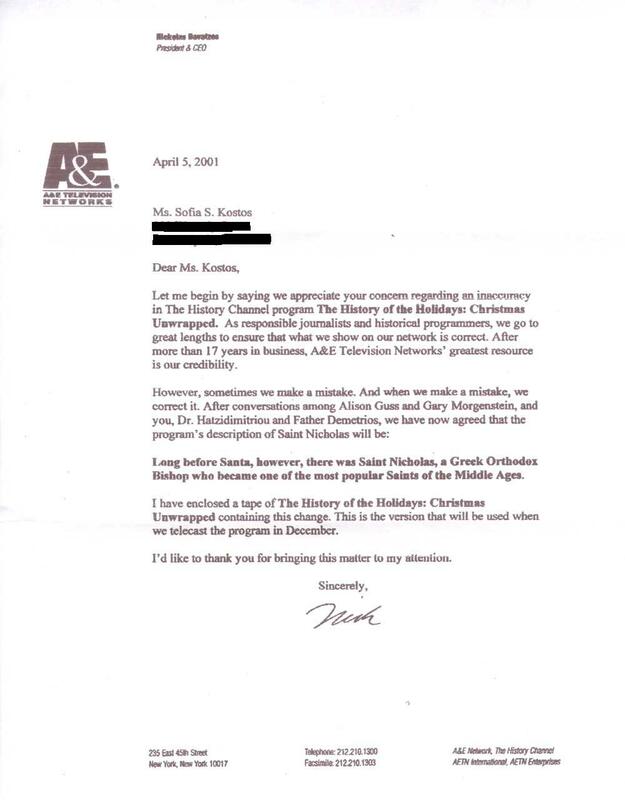 4.- Forcing Andy Rooney of "60 Minutes" fame to publicly apologize for calling Greek religious art "Turkish" in his nationally broadcast commentary. After a HEC coordinated effort, Rooney finally relented. Rooney stated: "To Err is human, to forgive is divine. Greeks, please be divine and forgive me." 5.- Persuading the Governor of Alabama, again by way of a HEC coordinated appeal to Greek Americans and their organizations, to recall his "Memorial Proclamation" that stated that millions of Turks were victims of Genocide in Asia Minor, thereby equating the perpetrators with the victims of the Genocide and prevailing upon him to ask forgiveness from the Greek, Armenian and Assyrian American communities for this historical error. 6.- Organizing and disseminating an online Petition to the Governments of Turkey, the US and the EU regarding the continuing illegal closure of the Greek Orthodox seminary at HALKI. That petition in 2001 that collected over 50,000 signatures from 65 countries. 7.- Organizing and disseminating the CYPRUS/ANNAN petition online in 2003, that in a number of days, collected over 7,000 signatures. 9.- Campaign against Baroness Ledford who visited the occupied Cyprus via the illegal airport of Tymbou. 10. Sunday Times of London published a misleading article claiming that Santa Claus (Saint Nicholas) was Turkish Saint. Dozens of our members wrote in to complain and set them straight. As a result the following month the Sunday Times published a correction. 11.- As a result of our campaign of protest over 150 letters were sent by our members and supporters to representatives of the American Companies that were invited to visit the occupied areas of the Republic of Cyprus illegally so as to set up trade with the puppet occupation regime and its vessels. The visit of the US companies was cancelled. 12.- United Nations (UN) had listed among it members Fyrom as Macedonia plus they had a web page as www.un.int/macedonia . A campaign organized by the forum of Professors and PhDs forced the UN to comply with its own resolution and replace the name macedonia with Fyrom. 13.- One hundred Fifty Seven HEC Professors, PhDs and MDs sent the above letter to President of the Hellenic Republic, Dr. Karolos Papoulias, expressing their concerns about the national issues.